HCT JR Company member to co-star on Roseanne! ABC’s forthcoming Roseanne revival has hired its first new cast member to join returning vets Roseanne Barr, John Goodman, Laurie Metcalf, Sara Gilbert, Michael Fishman, Lecy Goranson and Sarah Chalke. 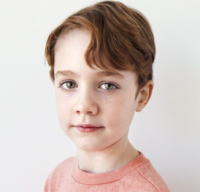 Newcomer Ames McNamara has been tapped for the series-regular role of Mark, Darlene and David’s 8-year-old son. HCT Student stars in A Net Will Appear at MST. Hoboken Children’s Theater student, Matilda Lawler, makes her professional debut in Mile Square Theatre’s A Net Will Appear with Broadway and Television star Richard Masur! HCT JR CO member, Willa O’Connor understudies the role and performs it on Matilda’s off day. Congrats to both extraordinary actresses!